Nickel is a metal that has, as its name suggests, high levels of nickel. Nickel, like other alloys, are resistant to corrosion and heat, because of they are comprised of two or more metallic elements. We are always willing to purchase nickel based alloys from our competitors; we analyze each piece of nickel with our analyzing equipment to determine how much each product is worth. 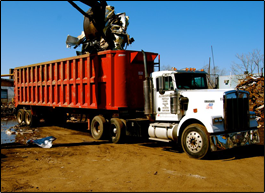 For more information about our scrap metal recycling services, please give Anestis Metals a call at 617-666-3405.